Description: A pocket pen that opens and closes smoothly and softly thanks to the power of tight tolerances and magnets. 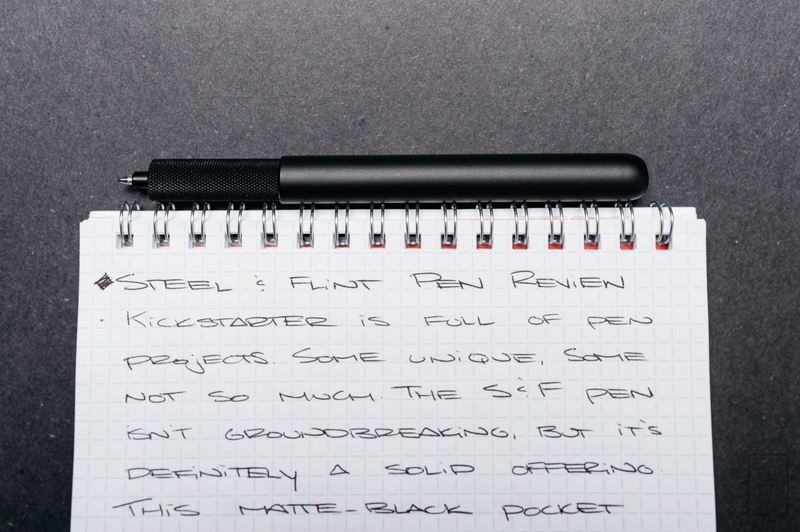 It seems like there’s another Kickstarter pen project out every time I load the site. That’s not a bad thing though.  I welcome the innovation and new ideas that the popular platform brings to the stationery world, and the Steel and Flint Pen is no exception. 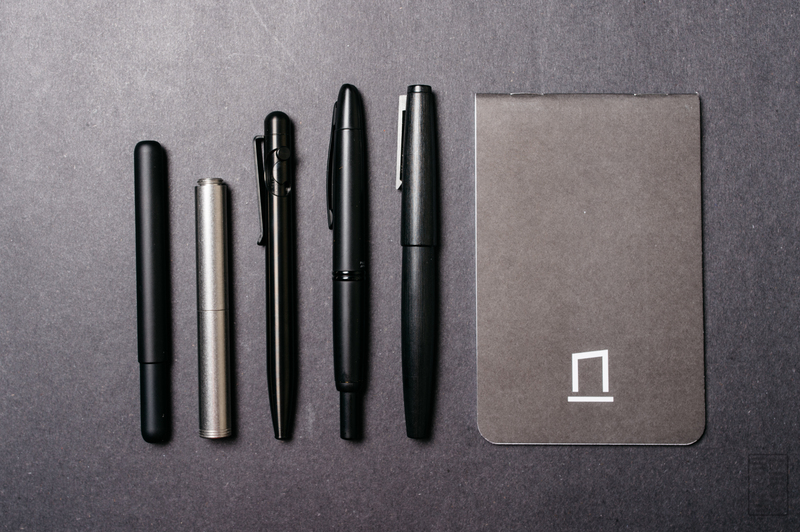 This UK-based firm has designed a minimalist pocket pen with a soft close cap that’s held in place via strong magnets. Let’s take a closer look at the prototype sample S&F supplied. 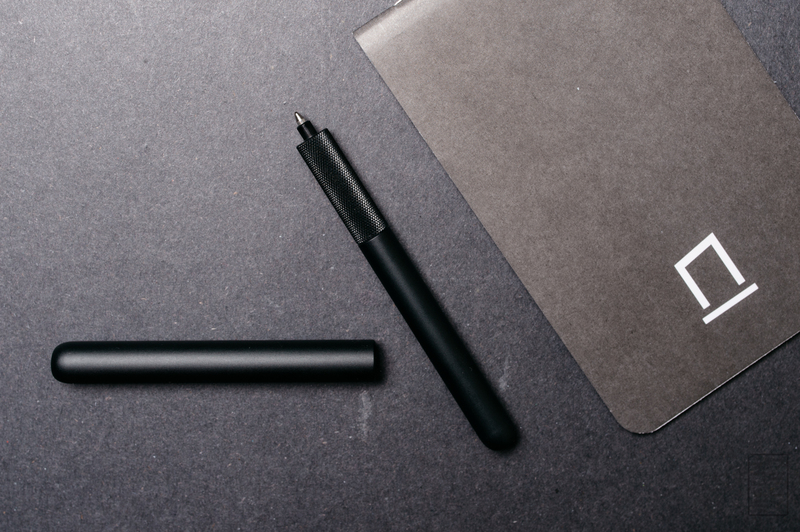 The S&F Pen is finished in a nice, dark matte black. They call it “basalt black”, and google tells me that basalt “is a dark-colored, fine-grained, igneous rock composed mainly of plagioclase and pyroxene minerals”. Lava rock. Cool. The description fits. The finish is smooth, yet has a slight amount of texture. The finish on the body and the cap match perfectly, as does the knurled black grip. 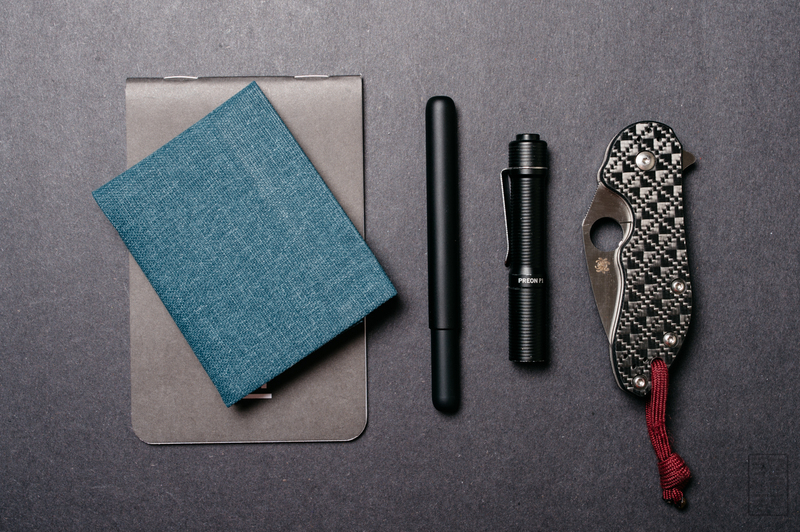 The pen has rounded sides (pocket friendly) and a knurled grip. 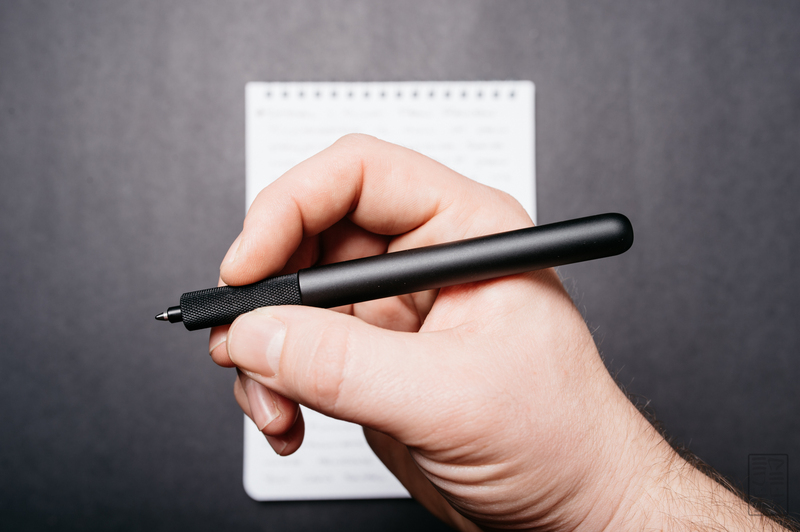 The tip of the pen has it’s own standoff where the refill comes out of, which allows it to stick out just enough past the grip so you can see where you’re writing. I like the minimal aesthetic of the S&F. It fits in with the rest of my matte black stuff really nicely, and I welcome it to my collection. The S&F has a long cap that slides back over the body of the pen. It takes a posting cap to the extreme. The cap is fun to play with, as the soft close mechanism slides into place with a satisfying “shhhhhhk”. The cap is held shut with magnets, and since it’s so long, I’m not worried about it opening up in my pocket. The knurled grip is described by S&F as “soft-grip” and I agree. There’s just enough bite to the grip without being too much. I can see myself writing with this for a while without getting tired or having my fingers sanded down by the knurling. The point of the pen sticks out enough so that you can see it clearly when writing. The design of the tip feels a little too simple. I think S&F could have done something conical or even rounded that matched the rest of the pen a bit better. Not a complaint, just an observation! Also worth noting: the magnets hold the pen onto wire binding. Not sure if this is an intended feature, but it’s awesome. The pen doesn’t roll off my desk (like a certain other rounded pen from Kickstarter *cough* Namisu Nova *cough*) during use and this is really helpful. You can see in the photo above how it just anchors itself to the binding! 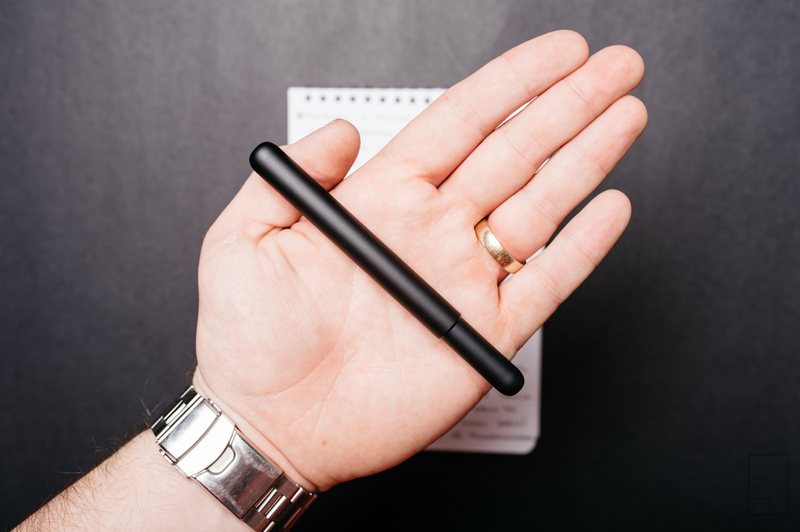 This pen feels great in hand and in pocket. It’s small, but not too small, and the weight is just right. I think they nailed it in terms of dimensions, material, finish and weight. I have knocked the pen around a bit, leaving a few scratches. They wiped off pretty easily and nothing is too obvious after a few days of carrying it in my pocket. As Brad “The Pen Addict” Dowdy mentioned in his review, I do see some potential long-term durability concerns. The knurled grip does rub against the inside of the cap. This may affect the tight tolerance that gives the pen its signature “soft close” feature by slowly sanding down the metal. I can’t speak personally, but I’m curious to see how it holds up. Also, the knurled grip does make contact with the edge of the cap when closing the pen. Mike over at Clicky Post shares some of the same concerns as well. This has already started to wear the finish away around the edge of the cap. Perhaps a conical tip paired with a slightly (even 1mm) narrower grip would alleviate some of these concerns? At the end of the day, they’re just concerns and speculation, and it could take YEARS of use to get to this point. The S&F pen starts at ~$69 for the silver and gold models, with another ~$7 for the black model. As of right now, this is a bit of an issue for me. Yes, I received the prototype free of charge, and yes, I do like it, but I’m not so sure I’d drop nearly 70 bucks on one. If this pen was $49, I could absolutely see many more people jumping at the opportunity, myself included. As of right now, the project is only a few pledges away from being funded on Kickstarter with over 20 days left in the campaign. I’m sure it will get funded. That being said, it’s a solid pen that will be 100% designed and made in the UK (which I suppose adds to the price as well). Like what you see? Pick one up before Friday, December 16th to secure your pledge. Which Spyderco pocket knife is that? Love the look of it. It’s the Spyderco Dice, I really love it.